At first glance, Newcastle-Upon-Tyne may seem to have little in common with the perennial host to the China Independent Film Festival (CIFF) – Nanjing. Blisteringly hot summers have earned Nanjing a reputation as one of China’s ‘Three Furnaces’, while here in the north east I find myself donning my shorts and flip-flops if the mercury hits 15 degrees. As Nanjing is fast becoming known across China as a centre for unofficial and alternative creative movements, the prevailing popular image of Newcastle is largely one of raucous stag and hen nights and Geordie Shore-style hedonism. Yet beneath a veneer of the ‘grim north’ lies a city with a vibrant arts scene, replete with independent and art-house cinemas, and audiences eager to expand their cinematic horizons. When it comes to screening Chinese independent films, Newcastle’s large Chinese diaspora and student population, Newcastle University’s growing East Asian Studies section and local enthusiasm for progressive film and media, might just make the city an unlikely candidate to become a centre for Chinese independent cinema in the UK. This potential has not gone unnoticed by staff and students of Newcastle University, which has now played host to two high profile Chinese independent film festivals. Back in 2012 Newcastle University welcomed the Beijing Independent Film Festival UK Tour and form the 12-15th May 2014 Newcastle opened its doors and handed over is screening halls to the 10TH Anniversary of the China Independent Film Festival UK Celebrations. This placing of Newcastle on the transnational Chinese independent film map has largely been the work of Newcastle University PhD candidate Lydia Wu and Modern Languages and Film Studies lecturer Dr Sabrina Q. Yu. Having recently returned from her PhD fieldwork researching film festivals in China, Lydia is herself a well-known face on the Chinese independent film festival circuit and was well positioned to take a leading role alongside Dr Yu in orchestrating the 10th Anniversary of the CIFF celebrations. Preparing for the celebrations involved months of careful planning, venue negotiations, funding applications and countless meetings between Lydia and her team of volunteers which brought together postgraduate students from the Schools of Modern Languages, Media and Film Studies, and Sociology. The celebrations centred on the retrospective screening of 13 films, including documentaries, fiction features and animated shorts, that have all been screened over the past 10 years of the CIFF in Nanjing. In addition to the film screenings, the celebrations also featured an exhibition of posters, video clips, photos and information offering an insight into the history of the CIFF and a number of talks and workshops. The 10th Anniversary of the CIFF celebrations in Newcastle formed part of a wider network of Chinese independent film events across the UK, coinciding with the London-based Chinese Visual Festival and preceding the 10th Anniversary of the CIFF celebrations in Nottingham. The collocation of these three events meant that Newcastle was able to invite a number of important players in the Chinese independent film scene, some of whom travelled up from London to attend the celebrations, while others arrived in Newcastle before heading on to events in both Nottingham and London. Esteemed guests at the Newcastle celebrations included CIFF Founder Prof Zhang Xianmin, CIFF Co-founder and Artistic Director Prof Cao Kai, China’s leading female independent documentary filmmaker Feng Yan (Dream of the Yangtze River, 1997, Bing’Ai, 2007), award-winning Tibetan director Pema Tseden (Old Dog, 2011, The Search, 2009, Silent Holy Stones, 2006) and Xiamen University Professor of Art Qin Jian. As the doors opened for our first screening on the afternoon of the 12th it seemed that months of planning, sending emails through various mailing lists, online promotion and long, wet days handing-out flyers had all paid off, as an audience upwards of 60 people gathered in Newcastle University’s Culture Lab for the opening film – Pema Tseden’s Old Dog (2011). Billed as ‘the Tibetan film’, is was no surprise that Old Dog drew in a large audience seeking a rare glimpse into the changing nature of everyday life in Tibet and anticipating the political controversy and tension that the words ‘Tibet’ and ‘Chinese independent film’ apparently suggest when placed under the banner of the same event. For many in the audience the film’s narrative appeared decidedly apolitical; though judging by the numerous tear-strewn faces as the credits began to role, Old Dog’s sombre climax had been moving nonetheless. Others, however, were quick to read underlying meanings and political metaphors in the film and it was on these points that many sought clarification from director Pema Tseden during the post-screening Q&A. Clearly accustomed to such interpretations of his work, Pema Tseden offered the decisive yet ambiguous response: ‘if you think it is political then perhaps it is political, all I have done is to try to show life as it is in Tibet today’. As the evening drew in the audience again took to their seats for Qiu Jiongjiong’s Madame (2010), an intimate encounter with the late infamous Beijing drag-queen Madame Bilan de Linphel, followed by a Q&A with CIFF Founder and friend of the director Prof Zhang Xianmin. Day two of the celebrations started with the opening of the exhibition A Decade of the China Independent Film Festival at Newcastle’s Northern Stage, displaying archival material that told the story of the CIFF from its birth to its current status as China’s most influential independent film festival. The exhibition was launched with a talk by Prof Zhang Xianmin who discussed the role that the CIFF has played in the history of the Chinese independent film movement. Again, questions from the audience turned to politics, as attendees sought stories of the difficulties of screening independent films under state authoritarianism and censorship. Prof Zhang’s responses evidenced his more abstract conceptualisation of the situation, describing censorship as a force that creates ‘black holes in our minds’, while maintaining that such ‘black holes’ are not unique to the Chinese context: ‘we all have black holes in our minds, there are always things we cannot say or cannot even imagine’. What Chinese independent filmmakers and festival organisers require, according to Prof Zhang, is the skill ‘to navigate around these black holes’. This theme of high abstraction carried through into the afternoon’s screenings of animated shorts which opened with Lei Lei’s Cotton Candy Universe (2008) and Pear or Alien (2008), two whimsical tales of colossal trees bearing cotton candy fruits and pear-shaped extra-terrestrials, followed by dream-like scenes of Tibetan mountains and skeletal demons in Gentsu Gyatso’s The Hunter and the Skeleton (2012). The sense of anxious impatience and imminent chaos created by Wu Chao’s Chasing (2011) marked a departure from the light-hearted and a descent into darkness beginning with disturbing images of a post-industrial landscape inhabited by animal-machine cyborgs in Qiu Anxiong’s The New Book of Mountains and Seas (2006) and culminating in Ding Shiwei’s Double Act (2013) with its bleak illustrations of glabrous technocrats ominously gazing over the panic-stricken masses. With the audience sufficiently unsettled, CIFF Co-founder and Artistic Director Prof Cao Kai was on hand to offer guidance through these surreal landscapes in his post-screening talk on contemporary Chinese independent animation. Day two of the celebrations was rounded off with an evening screening of Shu Haolun’s No.89 Shimen Road (2010) which drew in one of the largest audiences at around 60 people. Once again, it seemed that the allure of the politically sensitive had guaranteed high attendance, as many people stopped at the reception desk to check if this was ‘the Tiananmen film’, or the ‘6/4 film’ for Chinese speaking attendees. Prof Zhang was joined by Newcastle University’s Dr Joanne Smith Finley for a post-film Q&A and as questions turned to the pro-democracy student demonstrations of 1989, Prof Zhang seemed somewhat jaded by the audience’s appetite for controversy, yet his restrained responses where expanded upon by Dr Smith Finley who was able to share her experiences of having been in Beijing in 1989. 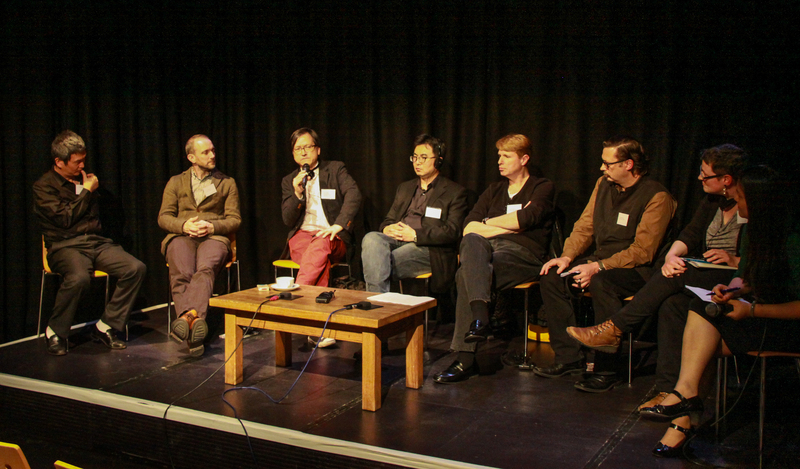 Bringing together film festival curators and scholars from China and the UK, day three of the celebrations started with the workshop Film Festivals in Focus for which CIFF Founder Prof Zhang Xianmin and CIFF Co-founder and Artistic Director Prof Cao Kai were joined by Edinburgh Film Festival Artistic Director Chris Fujiwara in a conversation hosted by King’s College London Professor Chris Berry. After discussing their relative responsibilities as festival organises and their respective visions for the future of their festivals, the four were joined by Dr Luke Robinson (University of Sussex), Dr Melanie Selfe (University of Glasgow) and Newcastle University’s Dr Sabrina Q. Yu and Dr Ian MacDonald for a wider discussion on transnational independent film and the potential for future UK-China collaborative festivals. The afternoon’s screenings began with Feng Yan’s Bing’Ai (2007), a harrowing documentation of one woman’s struggle against local authorities to negotiate fair compensation for the loss of her farmland after being told her home would be submerged upon the completion of the Three Gorges Dam. Having spent a number of years living with and developing a deep friendship with Zhang Bing’ai, the subject of her film, Feng Yan was able to capture in intimate detail the hardships face by just one of the 1.13 million people who were displaced by the building of the Three Gorges Dam in 2009. The unbridled ‘development’ and extreme inequality that form the wider social farming of Feng Yan’s Bing’Ai were interwoven with the remnants of regional superstition in the final film of day 3, Peng Tao’s Cremator (2012). In a post-film Q&A, Prof Zhang took to the stage again to explore this haunting story of an old man’s illicit business in posthumous matchmaking for deceased singletons and the ruptions caused by his encounter with the sister of his deceased bride-to-be. The final day of the CIFF 10th Anniversary Celebration in Newcastle started early with a master-class with Bing’Ai director Feng Yan in which she talked about how she developed her interest in the social impact of the Three Gorges Dam and her transition from environmental economist to documentary filmmaker. Feng Yan told the story of the ten years she spent living in a village on the banks of the Yangtze River, documenting the lives of the villagers as they watched the water level rise and prepared for their village to be submerged. Her extended residency resulted in close friendship with a number of women in the village, one of whom was Zhang Bing’ai, the subject of her documentary, allowing her access to the intimate and untold stories of women displaced by the project. Feng Yan gave a glimpse of her future work, noting that she is currently editing her ten years of footage into a further two documentaries depicting their lives of a young and an elderly women respectively. Following Feng Yan, Xiamen University Professor of Art Qin Jian gave a talk on his Sino-European collaborative art projects and presented moving image artwork by Contemporary Art graduates of Xiamen University. Films screened for the fourth day of the celebrations centred on the theme of post-industrialisation, though taking two vastly different approaches. The afternoon’s first film, Yumen (2013), directed by Xu Ruotao, Huang Xiang and J. P. Sniadecki, combined documentary filming with ethnographic reportage and modern art to produce a striking account of the ‘ghost town’ of Yumen in China’s Gansu Province, abandoned after the exhaustion of the local oil field. Shot using a 16mm camera and setting the fragmented stories of the few who remain in the town against a soundtrack of hyper-nostalgic kitsch pop songs, Yumen is a haunting narrative of a place consigned to memory and decay. Despite a comparable subject matter, the final film of the day stood in stark contrast to the eerie emptiness of Yumen. Telling the story of industrial decline in China’s north east through the comic tale of one man’s attempt to build a piano with the help of his friends, Zhang Meng’s The Piano in a Factory (2010) was a warm and uplifting finale to the Newcastle celebrations. Featuring north-eastern China’s renowned sense of humour and resilience to the hardships of adversity and unemployment, The Piano in a Factory was a fitting end to our celebrations in the north east of England, a region equally known for its industrial history and the joviality of its inhabitants. The success of the 10TH Anniversary of the China Independent Film Festival UK Celebrations in Newcastle marked not only an important moment in the story of the CIFF, but may well have announced the emergence of a new home for Chinese independent film in the north east of England. Having now hosted two successful Chinese independent film festivals and with local enthusiasm clearly in evidence, Newcastle-Upon-Tyne seems set to stay on the map of Chinese independent film and in the come-down from the high of our recent celebrations murmurs of future plans are already reverberating. To view a video of the event, please go here.